With the undercabinet lighting installed (that string of reflections on the shiny countertop), ’tis time to tackle the backsplash. 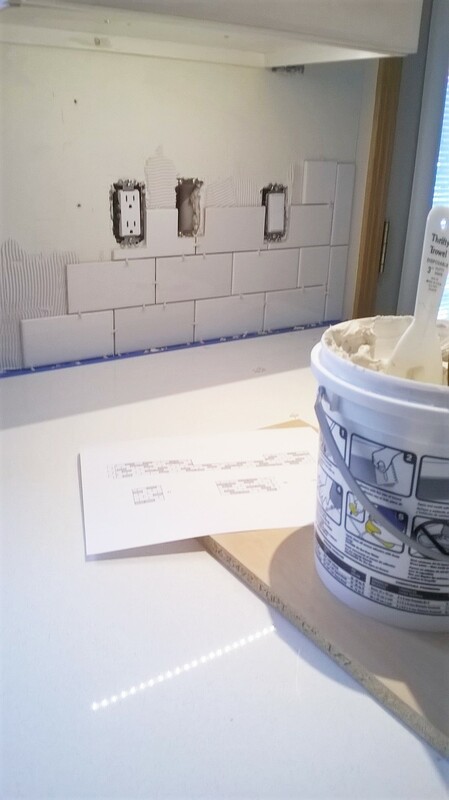 Simple white subway tile? Seems nothing is ever simple with us. In our stash of home-improvement bits was an almost full box of subway tiles. New tiles wouldn’t match exactly so we had to carefully develop a ‘random’ mix of new and old. That’s the chart by the mastic. A nice slightly rustic look which fits in well with the overall Midwest Scandinavian look I’m after. Yes, I made that term up and am a little too proud of myself about it. All those cuts. This will not be done in a day but it will be lovely.